Despite the status and wealth of those members of the aristocracy who turned up to meet Germanus, when being confronted about their Pelagianism by Germanus they were no match for the Roman's skill at the still effective powers of public debate, the art of rhetoric in which any Roman gentleman was trained. Germanus won over the crowd, and defeated the aristocratic arguments. In fact, it seems that such was the feeling against the nobility that they were only just saved from the attentions of a violent mob. Clearly their management of the country had not endeared them to the general populace. Germanus also met 'a man with tribunician power' (vir tribunicae potestatis) during his visit, and apparently miraculously healed his blind daughter . Although the use of the word tribunus as a military rank seems to be extremely loosely used in the Late Empire, on top of the evidence for the survival of Roman life at Verulamium, there exists the possibility that this tribune had commanded a unit of the Roman army which had disbanded after the break with Rome, and was now occupying a more locally-granted an appointment to help manage the city's defences. Germanus would certainly know a legitimate officer when he saw one so his biographer's account, if it hasn't been distorted, should be believable. However tenuous may be the connection between the tribune's rank and his assumed position, it remains an enticing possibility. One wonders about the condition of the city, though. Many Roman buildings clearly still stood and were occupied, but some later construction of much more modest abodes must have taken place. While Germanus was recovering from a broken leg following his visit to St Alban's shrine and his return 'from this place' (presumably back to Verulamium or Londinium) , 'fire broke out in a cottage [not a house] near his lodging, and after destroying the adjoining dwellings which at that place were thatched with reeds from the marshes, it was carried by the wind to the cottage where he lay'. If this was indeed one of the two cities mentioned above then the standard of living, at least in this quarter of the city, had dropped somewhat. However, it may well be the case that Germanus had elected to reside amongst peasants or tradesmen rather than with those wealthy Pelagians whom he met earlier, and that the wealthier folk still occupied the Roman heart of the city. Religious debate aside, however, defence was still clearly an issue. The army (or at least an army, in whatever form it now took) in Britain together with the laeti must have proved too few in number, too limited in its abilities, or perhaps simply too stretched in its capacity, to be able to meet all of the demands that were now being made of it. It seems that the Picts and Saxons had teamed up again to raid the coast and Germanus took command of the local defences, traditionally at Mold in North Wales, and managed to see off the raiders. The fact that he had to conduct a mass baptism of his troops before the battle suggests that he was not receiving help from the nobility (many of whom he had very recently upset) but that his men were mostly from the pagan rural Britons in the rough Welsh countryside who made up the farming workforce. 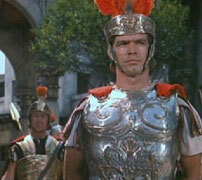 After that victory, Germanus' eventful visit seems to have ended, and he returned to Gaul. Perhaps Vortigern was among the Pelagians whom Germanus managed to verbally defeat during his visit. There certainly seems to have been an undercurrent of disaffection from the people for the nobles who met Germanus, and who narrowly escaped a lynching. If they were part of Vortigern's ruling party then the disaffection would certainly have involved him to an extent, as it still does whenever something scandalous occurs in modern British politics. 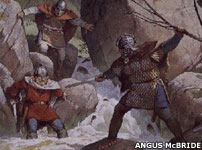 Gildas states that Vortigern was outflanked in internal British politics, suggesting an opposition in government. His powerbase may have been far from reliable at this point in time, so perhaps he was also not able to rely on the military forces at his disposal, especially if some of them had previously been supplied by Catholic, or pro-Roman, territorial leaders within Britain. Bede, A History of the English Church and People, Ch.19. In the year following Germanus' visit, and in line with standard Roman imperial policy in Gaul, Vortigern brought in Saxon allies (foederati) to help restore order on the borders. As with previous deployments of barbarian allies, they were probably positioned outside various cities in small settlements and, according to Gildas, they did the job for which they were hired. It has already been shown that Germanus himself had to mount an expedition of his own in 429 to fight off raiding barbarians, but the problem cannot have been entirely solved - unless we look at the situation from the political angle. If Vortigern was losing his grip on power, perhaps the mercenaries were introduced to give him an extra bargaining chip, and some hired muscle if he required it. This helps paint a picture of Vortigern's power slipping away from him and his opposition perhaps gaining in strength as a result. If this is correct then clearly a confrontation was becoming inevitable. According to what few scraps of evidence remain, the rift between Vortigern's pro-Celtic faction and that of the pro-Roman Aurelius Ambrosius (Ambrosius the Elder) erupted into open hostility circa 437/8. He and Vortigern fought the battle of Guolloppum (Cat Guolph, identified as Wallop in Hampshire). Whatever the outcome of the battle, and whatever other action took place as part of this civil war, it did nothing to strengthen Vortigern's authority, and doubtless damaged political cohesion in Britain even further, as well as weakening its already overstretched military forces. Taking advantage of the political turmoil, circa 440 the Saxon foederati, almost certainly positioned around the country near the cities, revolted, ravaging the island from east to west in much the same way as the Vikings would four hundred years later. During this catastrophe, the warring British factions probably agreed to temporarily patch up their differences while they fought a common enemy, but Ambrosius the Elder was killed, and Vortigern struggled for some time to reassert what little of his authority remained. For many this was the last straw. Life in western Gaul, in Armorica and Soissons, would have looked far more stable and settled that it was looking in Britain so, due to the social instability caused by this devastating event, there was a wave of migrations by Britons to Gaul, especially to the already established British colony in Armorica. Again, therefore, the wretched remnant, sending to Aëtius, a powerful Roman citizen, address[ed] him as follows: - 'To Aëtius, now consul for the third time: the groans of the Britons'. Eventually, order was restored. Those cities that were still inhabited were repaired and their defences restored. Improvement works were carried out on some of them and they were cleaned up and restored to a habitable condition. The population had declined somewhat due to deaths by civil war, Saxon pillaging, and the flight of many families to Armorica, and there appears to have been a level of contraction in the proportions of the inhabited areas of cities, but life went on. Unfortunately, disaster returned in 446 in the form of serious plague in southern Britain. Unburied bodies could be found in the streets and more cities were abandoned. For many who remained, their worlds contracted further, with them often living in wooden huts inside the local amphitheatre or similar Roman buildings, as was the case in Corinum (modern Cirencester). There, the amphitheatre's entrance was reduced in size, making it more defendable. The picture of urban occupation appears to have been very varied across the country. Some cities seem to have been abandoned relatively early, either deliberately or as a result of being sacked during the revolt, or due the plague, while others continued to survive, if not thrive, well into the fifth century and beyond. 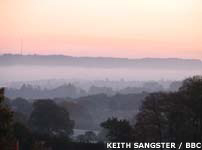 This period of partial urban abandonment coincides with evidence of the reuse and refortification of Iron Age hill forts. Cadbury Congresbury in Somerset started to produce substantial quantities of Mediterranean pottery at this time, with smaller amounts also coming from South Cadbury, as local leaders moved their residences to more protected locations. Aegidius was elected magister militum in Gaul under the prefect, Aëtius, in around 450. 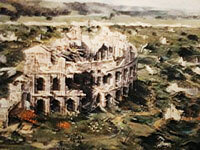 Later he became chief minister in Gaul and was an ardent supporter of Majorian, whom he helped to power. When Majorian lost ground against replacement prefect, Ricimer, Aegidius rebelled and created a Roman rump state that became to be known as the Domain of Soissons. Gildas asserted that the Britons, having been deprived of Roman military protection after 409, wrote to a "Roman commander Agitus". While generally being accepted as Aëtius, the possibility remains that it could be Aegidius. Such a disastrous decade and the necessity for reorganisation and recovery that must have followed it clearly put paid to any thoughts of continuing the civil war, even if there was a new leader to take over the command of Vortigern's opposition. A footnote to the religious confrontation in 426 is that Germanus returned to Britain circa 446/7 to rescue the Catholics from 'certain people' who were again promulgating the Pelagian heresy. It appears that this was a last hurrah for the Pelagians. Germanus was able to persuade the populace to embrace the Catholic faith again, and the Pelagians, who had been banished by common consent of the Britons, were taken back to the Continent with Germanus. It may be a coincidence, but the Pelagian heresy clearly seems to have been at its strongest while the proposed pro-Celtic faction was in charge. Once the pro-Romanised faction was again in charge the heresy seems to have been entirely eradicated. Does this religious alignment of Pelagians against Catholics tie in with the assumed political alignment in Britain, with the anti-Romans following anti-Roman methods of worship? It's an intriguing idea which is supported by the view of the Pelagians in 446 being a last remnant who were then expelled from the country. Now apparently almost entirely friendless and probably desperate for new allies, Vortigern would naturally have followed the normally successful policy of hiring more foederati to bolster his flagging command - the fact that the last group had caused so much damage notwithstanding. On the Continent, Aëtius had done precisely the same thing on a much bigger scale when he settled the Burgundians in Savoy in 443. In Britain there was probably little immediate threat of the civil war flaring up again to further threaten his dubious position, so it probably seemed like a good idea at the time. The fact that these new allies would turn on him in the worst possible way may not even have occurred to him, although he does seem to have changed tactics in settling them, taken the precaution of keeping them well away from any British cities by allotting them land on an island. Either way, the 'Adventus Saxonum' revolt of circa 450 was worse than the short-lived pillaging of a decade previously. 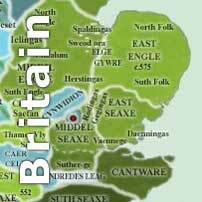 Kent was quickly lost during some apparently hard fighting and a Germanic kingdom was formed there. Vortigern seems to have lost what little support remained to him and when, circa 455, Ambrosius Aurelianus, the presumed son of Ambrosius the Elder, returned to Britain from Armorica to chase Vortigern out of office, he apparently had little trouble doing this. The pro-Romans had won, although the Britain they now controlled was a very different one from that of 409. Either way, this can be taken as a point at which Britain left Roman knowledge and contact almost completely. While the Roman way of life had continued fairly smoothly between 409 to about 437, the subsequent civil war, foederati rebellion, plague, emigration, and the loss of east coast territory, all signalled a significant change in the way British society would survive in the future, with the emphasis on Romanisation, and even finding the resources to maintain it, no longer being something that could be indulged. Brief mentions show that a possible central administration of some kind continued for perhaps the next half a century or so, and that it was following the Catholic faith until at least 480 (according to Germanus' biographer). 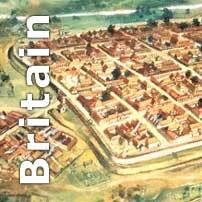 However, even by the middle of the fifth century, the Roman way of life in Britain was becoming a fading memory.